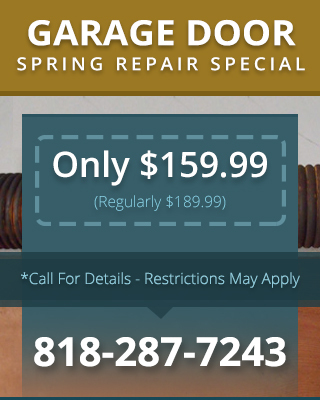 Broken garage door springs can cause many problems, from the inconvenience of being unable to open and close your door to extensive damage to cables, tracks, and other garage door components. 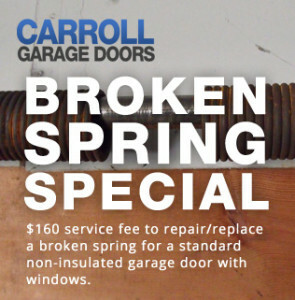 Garage door spring repair is definitely not a job you can undertake on your own. Not only are the broken springs still under pressure, special tools are also required. Fortunately, you can call Carroll Garage Doors for fast, efficient, and safe service to get your garage door back in working condition as soon as possible. When it comes to caring for custom garage doors, you can’t just choose any handyman or garage door repair company. Carroll Garage Doors can provide expert garage door repair & service West Hills CA for your custom doors regardless of whether or not we designed them. We frequently work on wall-mounted, swing-open, and roll-up doors. We can also service and repair various types of garage door opener remotes, whether you have a basic model or an advanced one with code panels and other high-tech features. Even if you’re not sure what part of your garage door needs repair, you can call us out to take a look. If you decide to make a repair, the service call is free.